ost vessels that visit the Town Dock sport contemporary anchors – plow-shaped CQRs, triangular Danforths and curve-fluked Bruces. Not so “Mimi Rose”. Recently the traditional wooden cutter spent a few nights at the the town dock. She sported ground tackle not often seen used in these waters. Lashed to her bowsprit were two fishermen anchors. A third, heavier specimen, graced her fore-deck. Mimi Rose. Her keel was laid in 1983 and she was launched in 1991. Thirty-two feet on deck and 10 feet wide, she draws 5 feet. The vessel’s anchors. On the bow hang a 35 and 42-pound fisherman anchor. Secured to the foredeck is a 75 pounder. So far, it hasn’t been deployed. Cruising aboard Mimi Rose are Colin Sarsfield and Anne Bryant. 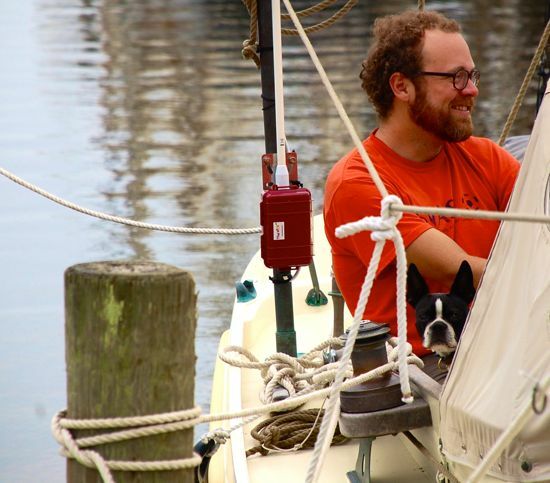 They started their voyage last September in Brooklin, Maine, making it as far south as Cumberland Island, Georgia by January. They are now heading home. Colin and canine crew member Maye. Mimi Rose is a traditional plank on frame cutter. Designed by Joel White and Robert H. Baker, she is built of eastern white cedar copper riveted to steam bent oak frames. Though tropical hardwoods were used in her construction, she also features native timbers. Her knees are cherry and her painted bulwarks locust. Those fishermen anchors look right at home lashed to her varnished wood bowsprit. The twin anchors ready for deployment. The fishermen anchor is among the oldest of anchor designs. It relies on large flukes and heavy weight for holding power. In recent years, though, they have been largely replaced by more contemporary models. For Mimi Rose, though, they have worked out well. They’re in keeping with the vessel’s traditional character. They also work, Colin says, in a wide variety of conditions. The Sampson post that secures the anchor rodes. 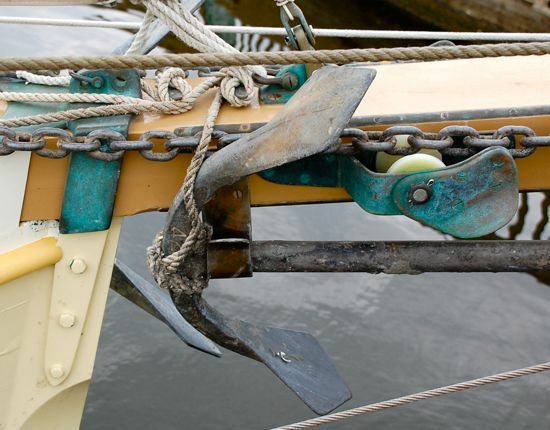 It is integrally secured to the vessel’s timbers. 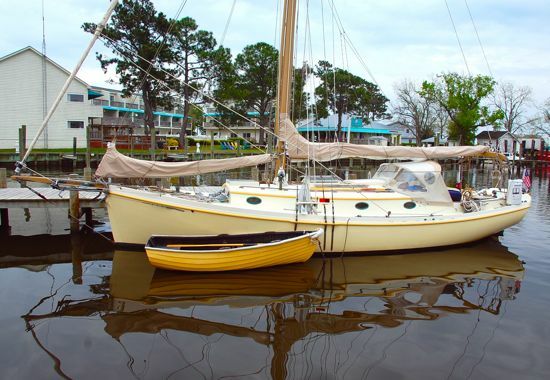 In home waters, Colin says he’s used them to anchor in, “rock, pebbles, shells, sand and weird stuff – like kelp and rocks or rocks and shell.” In North Carolina waters he’s encountered lots of mud and sand. And some pretty challenging conditions. In the Oriental anchorage, he weathered 30 knot winds. In Belhaven, he says he was faced with 3 foot seas. So far, his fishermen anchors have held in all conditions. There is a catch. 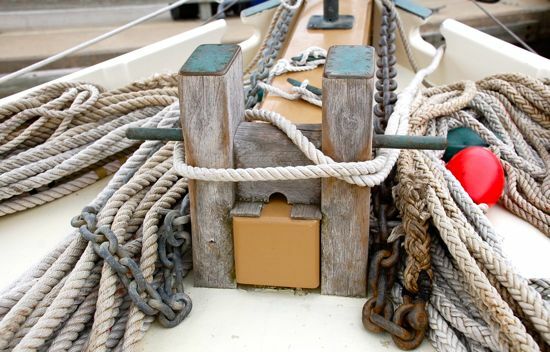 Colin says, “the downside to fishermen anchors is they’re a pain to store on the boat. 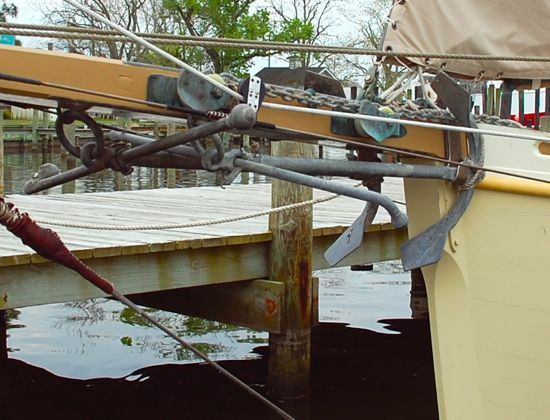 They’re not easy to use if you don’t have a bowsprit or cat eyes to lash them to.” Cat eyes are specialized davits used to secure fishermen anchors. Traditionally, they are found on larger vessels. On smaller, recreational boats, they are rare. 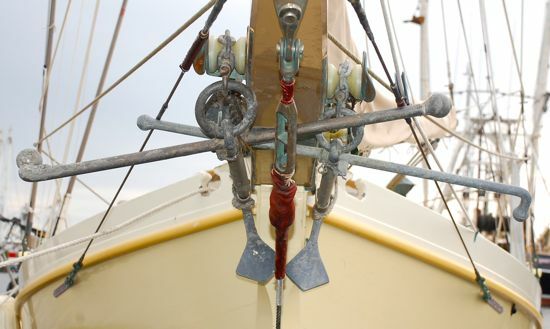 Lacking cat eyes, Mimi Rose’s anchors are stowed along side her bowsprit. After the anchor is raised from the water, it is hoisted parallel to the bowsprit. The anchor’s shaft is lowered in to a curved bracket. For extra lateral stability, the fluke is lashed in place with a length of line. The anchor secured for sailing. In sailor speak, “this anchor is catted to the side of the bowsprit”. In a nod to traditional lingo, while Mimi Rose doesn’t have cat eyes, her anchor is still “catted”. Unlike most vessels, where the anchor rode is stored below decks, Mimi Rose’s anchor line is stored on deck, flaked in large, loose coils. A few lengths of line secure the coiled rode while the vessel is under way. Anchor rodes stored in Mimi Rose’s foredeck. 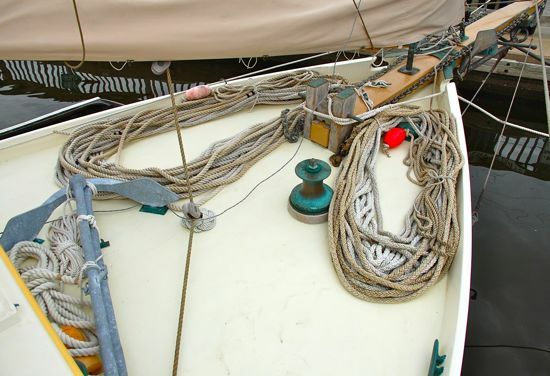 When the anchor is dropped, the rode pays directly off the foredeck. The bronze windlass is used to retrieve the ground tackle. From Oriental, Colin and Anne plan to return to Maine. There, they hope to build a dinghy they can carry aboard Mimi Rose. Also on their wish list is a wind vane. They have no plans to change their anchoring gear.